CIOs and other leading IT decision makers are striving to deliver cloud economics and agility from their on-premises infrastructures. Using all-flash storage is a key step in building a modern cloud data centre. 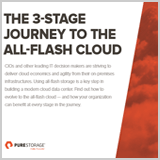 Find out how to evolve to the all-flash cloud - and how your organisation can benefit at every stage in the journey.